We collect and process your personal data whenever you access our website online at www.brocoglass.ca or any alternative address (the “site“) and ask us to provide our services to you via the website. This Charter of Personal Privacy (the “charter“) explains the various ways we are allowed by law to use your personal data. This charter is an integral part of the terms and conditions of use of the website (“the terms and conditions of use“) and must be read together with them. 1. Identity of the party responsible for processing personal data. The party responsible processing personal data is Broco Glass®, a division of Belron Canada Incorporated, having a place of business at 8288 Pie-IX Boulevard, Montreal (Quebec), H1Z 3T6 (referred to as “Broco Glass®”). 2. Collection and use of your personal data. Personal data: Broco Glass® collects data that allows us to identify you directly or indirectly, such as your last and first names, home or business address, telephone number (land line or mobile), email address and the make, model and year of your car. You are not obliged in any way to provide such personal data. However, if you do not, we may not be able to provide the services offered on this website or in each Broco Glass® franchise location. 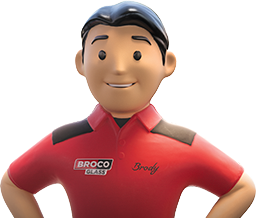 This information is collected whenever you contact a Broco Glass® franchise location for work on your vehicle’s window glass, or when you ask for an authorized franchisee representatives to call back and provide information that will help you identify the type of vehicle glass problem you are having. Broco Glass® franchise locations will need this information in order to (i) book your appointment with you, (ii) have one authorized franchisee representative to contact you by telephone, email or IMS to finalize or confirm the details of your appointment with its location, (iii) provide information you are seeking, or (iv) provide the service you have requested. Once you have used the service provided by Broco Glass®, we may use your personal data to contact you in order to evaluate your satisfaction with our services and we may also use your personal data – unless you have refused the use of your personal data for this purpose – to send commercial messages by conventional mail, email, IMS or telephone, concerning similar services we provide that may be of interest to you. You have the option of cancelling this service at any time without charge (except any possible charges for transmitting your cancellation request). To do so, please follow the instructions included with these messages, or contact our customer support department (contact information appears at the end of this charter). 1. Connection data. This website may collect connection data that can be used to identify you, such as your IP address, type of web browser being used, operating system being used and other data and connection files that this website acquires automatically (including the identity of your internet service provider, the name of the site that enabled you to connect to this website, the number of pages visited and the time spent on each page). We use this information to manage this website and analyze the visits to the website and its volume of traffic. 2. Anonymous data. This website uses Google Analytics to provide basic reports of activity on the site; this is done with the cooperation of a supplier and their search engine optimization work. The information is anonymous and cannot be used to identify a website user either directly or indirectly. It is used by Broco Glass® to help us provide better service on this website. Each visitor’s personal information is saved under an anonymous identity in order to create a user profile. Cookies may be used for this purpose but the data will only be collected and stored anonymously. The data will not be used for personal identification of visitors and will contain no information of a private nature. Our website is intended exclusively for use by persons 18 years of age or older. It is not intended for use by minors. We do not knowingly collect or process personal data relating to minors. If we find that we have acquired such information through this website, we will take appropriate measures to delete this personal data from our servers. 5. Communication of your personal data. In the course of providing services on this website, we may have to obtain outside help and make use of third parties. These include service providers, computer system maintenance providers, website hosts and internet service providers, who help us maintain and manage our website activities. Furthermore certain data, including personal data, may be transferred to, processed and stored by service providers located in other jurisdictions, including the United States regarding Broco Glass® development and proposed implementation of a new retail platform including a new point of sale system. These suppliers, service providers and marketing partners may make use of your personal data solely for the purpose of providing services to Broco Glass® in the context of the purpose or purposes for which Broco Glass® has collected such data. They may not use this data for any other purposes. We may also have to transfer our database, including personal data concerning you, to a third party in case of the sale, merger, or assignment of the assets or inventory, in whole or in part, of Broco Glass® or of this website, or in the case of reorganization, or some other case, including when the transaction is still in the planning stage. We may also disclose your personal data to third parties in order to comply with a demand by governmental or legal authorities, or to meet our own legal or regulatory obligations, protect and defend our rights and interests, or prevent any abuse or abusive or unauthorized use of this website, or for any other reason permitted by law. Finally, we may, with your prior consent, communicate your data to third-party partners for the purpose of allowing them to send you commercial messages by email, IMS, conventional mail or telephone. Broco Glass® may transfer your personal data to subsidiaries, affiliated companies or service providers that are located in countries other than Canada. Should this be necessary, Broco Glass® will make sure that your personal data will be transferred securely, subject to a data transfer contract or other appropriate means provided for by applicable legislation. However, authorities in such jurisdictions may be able to access your personal data under applicable laws in those jurisdictions. By using this website and the services available on this website, you expressly agree to the transfer of your personal data outside Canada, including in the United States. This website contains or could contain links to other third-party sites. This charter applies only to this website. It does not cover information acquired or processed on third-party sites whose links appear on this website. Broco Glass® is not responsible for the personal data collection made by these sites or their management practices. We suggest that you read carefully the privacy protection charters for any site you access by clicking on the corresponding hyperlinks that appear on this website. Managing your data in a completely secure and confidential manner is a matter of great concern for us, and we take all possible technical and organizational steps to avoid loss, misuse, alteration or deletion of your personal data. Our secure data protection systems meet generally accepted industry norms. If you have any questions about this charter or the use of your personal data, or if you wish to request us not to use your personal data in any way, please write to us at: Broco Glass® – 8288 pie-IX boulevard, Montreal (Quebec) H1Z 3T6 or by email at info@belroncanada.com. This charter may be subject to amendment at any time. We will notify you on this page so that you will always be informed about the data we are collecting, the uses we are making of this information and the circumstances in which it may be disclosed. This charter was last amended on September 2, 2014.